Cocktails are a form of art in the business of making spirits. They come in a variety of forms, concoctions and like any other art form, require good quality implements for their creation. A cocktail strainer is an integral part of barware required to make cocktails. Here’s a guide to what you need to consider before you buy a strainer, regardless of whether you are a professional bartender or a hobbyist. What Is a Cocktail Strainer? What Kind of Strainer Should I Get? What Should I Look for While Buying a Strainer? A cocktail strainer, as the name suggests, helps strain away unwanted leftovers which inevitably collect in the drink once it is prepared. Whether making drinks for guests or customers, the last thing you want is them crunching on a shard of hard ice or fruit-seed that’s managed to slip away from your shaker, into the glass. A good strainer will help you make a clean, smooth drink which is free of ice chips or fruit waste. There are three kinds of strainers used across the spirit-world which fulfill different purposes. They are designed differently and bartenders often use one or the other depending on how well it fits their hand, how easy it is to use and clean. Bartenders usually have not just one but several handy, since the design of each strainer caters to a specific aspect of making cocktails. Consider your purpose and decide which strainer suits you best. This strainer is used best for completely removing ice chips from your cocktail drink. The spring attached behind the disc helps to filter ice effectively so that your drink is free of cold shocks and tastes smooth. 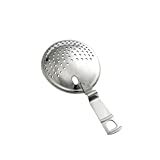 Owing to its design and size, this strainer works best when using a cocktail shaker or tins. The Hawthorne strainer can be used to adjust to different sizes and is generally quite inexpensive. However, it can also be tricky to clean and is fragile. The Hawthorne is usually a favorite with professionals because it adapts itself to a variety of sizes. It also works swiftly which is an important consideration when you’re handling customers. 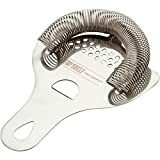 As the name suggests, this strainer is best fitted to remove those icky fruit-bits when making a mint julep or similar fruit-based cocktails. 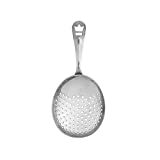 This strainer is designed to be used easily with glasses. Its long handle helps in keeping the strainer in place when pouring the drink from the glass. 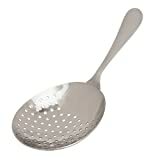 While it works a little more slowly than other strainers, it is more durable and easier to clean. The Julep is a good choice if you’re a beginner because its design allows better control while holding it over the glass and passing the drink through. This is a strainer you should consider buying in addition to your primary strainer. This is because sometimes, bits of fruit and ice can find their way into your drink despite being strained through the Hawthorne or the Julep. A fine mesh strainer is best used underneath your primary strainer so that the drink is doubly filtered of any unwanted waste. Since it is used to strain tea, it is widely available and also inexpensive. It is important to ensure that you buy a strainer made of good quality material because it is going to be used frequently, over a long period of time. It needs to be durable and should be able to handle long hours of usage every day. 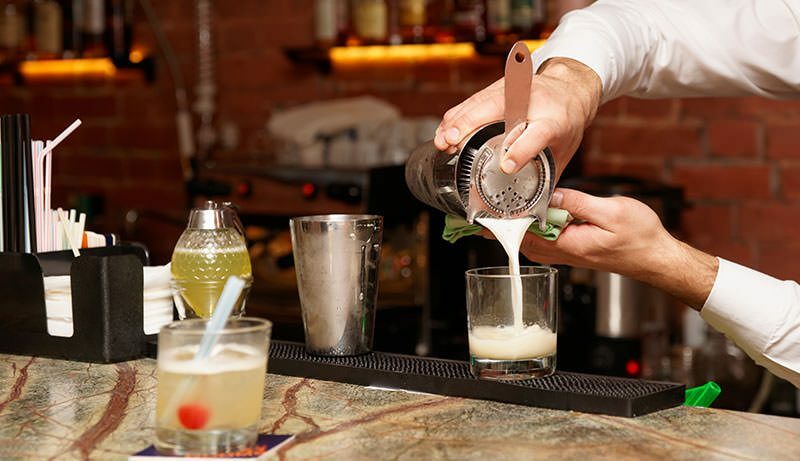 If you are a professional bartender, consider the appearance of the strainer as well. Strainers are available in a variety of accents such as copper-plate, gold-plate and black-plate. You can choose the one which goes best with the ambience and theme of your bar. It is also important to consider how the design of the strainer lends itself to being cleaned. Strainers are high-maintenance: they need to be cleaned thoroughly in order to carry out filtration efficiently. Here’s a selection of three premium quality strainers, one each for the different kinds of strainers there are in the market. 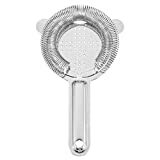 All the strainers mentioned here have earned top reviews from bartenders across the world and will definitely be a great addition to your existing barware. This Hawthorne strainer is exceptionally designed. It ergonomically fits into your hand and is best for long hours of usage. It is designed thoughtfully keeping in mind the actual struggles and needs of bartenders, making it a pleasure to use. It has been engineered especially for professional bartenders. It doesn’t hurt that its material lends itself to a stylish and classy appearance, making it an asset for any bar. Beautiful design and easy to use. 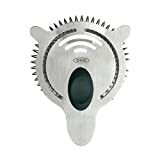 This strainer is designed to suit long hours of usage. The rubber grip on top makes it easier to hold when pouring. The material is thick and strong, improving its durability. A slight lip on the edge of the disc means that some waste may pass through. It doesn’t have a handle so it may be difficult to handle for beginners. This is slightly more expensive than other strainers. If you are a professional bartender looking for a good-quality Hawthorne strainer, this is a good bet. Although it is on the slightly expensive side, its excellent design and appearance are well worth the investment. As a testament to its quality, 84% of its reviewers on Amazon have given it 5 stars. Manufactured by Harold Import Co., this Julep strainer is made of stainless steel. While that means that it is a little heavier than your average Julep strainer, it won’t rust, corrode or react with any cocktail ingredient. The welding is seamless, making it highly durable. It is also quite easy to clean and maintain. Its steel build makes it well-balanced and stable while pouring. It is dishwasher-friendly and easy to clean. Its size will suit both small and large hands well. The fill lines can be hard to see when making a drink. Has the tendency to resist being taken back up after shaking a drink. While this Julep strainer might seem a little expensive in comparison to others in the market, its solid material makes it a good buy, both for professional and personal purposes. Its fill lines take some time getting used to, making it a little tricky if you are an amateur bartender. If you don’t mind a little heft in your strainer while making a drink, this strainer is perfect for your needs. An excellent cost-effective choice, the RSVP Endurance strainer is a good addition to your primary strainer. Its size makes it ideal for a variety of drinks and its handle makes it easy to use. Its steel build means that it stands out from other fine mesh strainers in the market which are often made from flimsy alloys. Its extra-fine, stiff mesh ensures top-quality filtration and durability. A U-shaped bar at the opposite edge helps to hold it over the glass easily. High-grade steel makes it sturdy and safe to use. Relatively cheaper than other strainers in the market. The extra-fine mesh might make it slower to use. Its steel build may make it heavy to hold for some. The conical shape may make it difficult to wash by hand. This is one of the finest meshes in the market, so if you’re looking for something which can filter out pretty much the tiniest speck of ice or fruit from your drink this is a good bet. 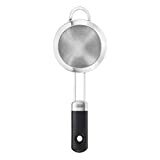 It doesn’t hurt that almost 80% of this strainer’s reviewers on Amazon have given it 5 stars. As any bartender worth their salt will know, making cocktails is delicate work which requires top-quality, durable tools. While making a good cocktail might be fairly straightforward, a good cocktail strainer goes a long way in making a drink smooth, flavorful and consistent. Ensure you have one – or several – on your counter before you begin shaking. Some really nice looking options for my home bar. I prefer something with lots of stainless steel since the bar is in my mancave. Thanks for the great options.